I’ve always had a love affair with cheese. When I was first introduced to camembert as a teenager, I loved it so much I once ate a whole wheel of it in the closet. Like literally, sitting inside of the closet so that no one could come between me and that glorious oozing block. But I’ve never had as much luck with hard cheeses. Something about the drier texture always said ‘meh’ to me, and while I’ve never disliked it, it has never swept me off my feet. Well dutch cheese actually straddles the two worlds for me. It definitely classes as a hard cheese, but somehow retains a lovely creamy, almost waxy quality to it that doesnt dry out your mouth like hard cheeses can do. 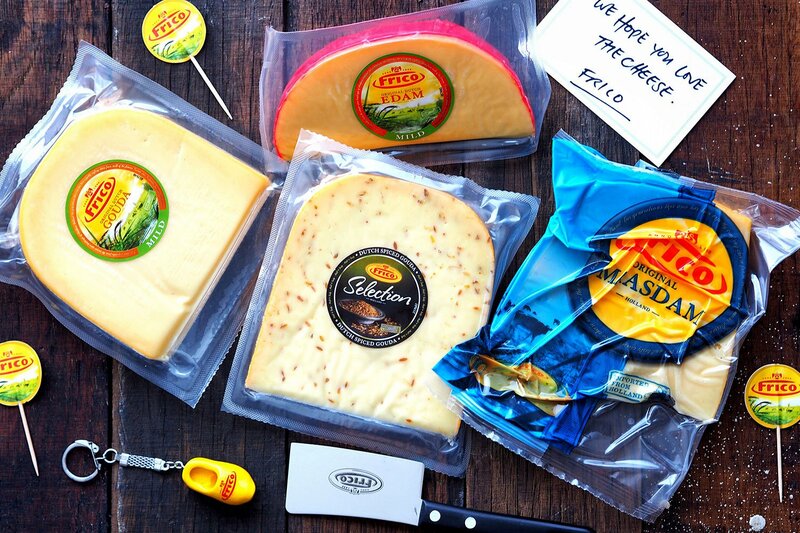 I was given samples of Frico cheese – maasdam, edam, and gouda – and I actually got real hooked on the cumin-studded Gouda. Frico is a Dutch company who’ve been making cheeses since 1898, so who better to rope me into the hard cheese world than such an experienced cheese maker? And I didn’t have to be in the closet this time! However. As nice as it was as an eating cheese, it wasn’t quite as good in other applications. The sweetness of the maasdam and gouda meant that it interfered with the aioli that I like to put on my sandwiches, even though it melted nicely. Finely grated, it was an okay cheese for salads, but didn’t really contribute as much as say, parmesan for a kick of sharp flavour. But who needs to cook with it when you can just EAT THE WHOLE BLOCK?! It may not be a staple in my cooking, but at least now I have a fantastic, rich addition to my cheese platter – which may or may not replace my meals. Shhhhh. Insatiable Munchies was provided samples of Frico cheeses for review.